When looking at the Medi-View-156 Medical Panel PC for the firs time, one is greeted with the modern IP65 certified front of the system, which is coated with an antibacterial agent. The base of thisMedical PC is the Intel® Atom Z3735F processor. This onboard processor is one of the more recent candidates of the Atom product family from the Bay Trail generation. With a target TDP of only 2,2W the CPU still offers four cores with a base clock of 1.33GHz and a 1.83GHz burst clock. The system supports 2GB DDR3L memory, the Medi-View-156 is already equipped with the maximum amount supported. The operating system and user data are stored on the integrated eMMC card. 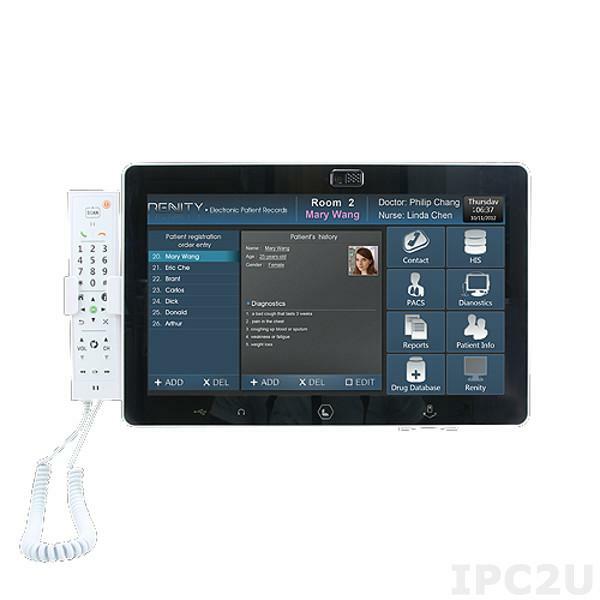 The I/O options of the Medi-View-156 Panel PC are manifold: 3x USB 2.0, 1x Micro USB, 2x Stereo Phone and 1x Digital Mic. PoE, RFID, WiFi and a multimedia handset can be installed upon request. The audio functions are handled by the Realtek ALC5645 chip, the sound is emitted via two small 3W speakers. Combined with the integrated webcam this device is excellent for making video calls and remote diagnostics. 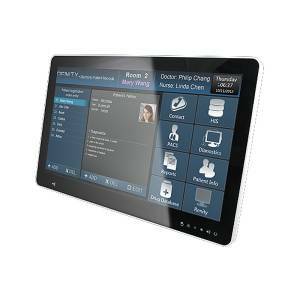 The display itself features a resolution of 1366x768 pixels, the brightness is in the mid-range with 220 cd/m2. Thanks to the LED technology used in this panel the contrast is 500:1, the touch technology used is projective capacitive. Physical network transfers via cable are handled by the Microchip LAN9512 network controller which delivers Fast Ethernet speeds via a RJ45 Port. An ATX power supply can be used to power the device. The extended operating temperature for the Medi-View-156 Panel PC ranges from 0° to 40 °C, the humidity should not surpass 90%. With dimensions of only 392,45x255,45x63,42mm the device itselfs is rather compact. Apart from Android 4.4 both Windows 8.1 and 10 can be installed.